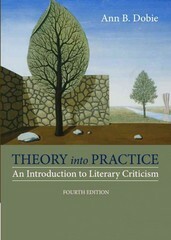 Theory into Practice 4 Edition Beginning with more accessible critical approaches and gradually introducing more challenging critical perspectives, THEORY INTO PRACTICE provides extensive step-by-step guidance for writing literary analyses. This brief, practical introduction to literary theory explores core theories in a unique chronological format and includes an anthology of relevant fiction, poetry, and nonfiction to help bring those theories to life. Remarkably readable and engaging, the text makes even complex concepts manageable for those beginning to think about literary theory, and example analyses for each type of criticism show how real students have applied the theories to works included in the anthology. Now updated with the latest scholarship, including a full discussion of Eco-criticism and increased emphasis on American multicultural approaches, THEORY INTO PRACTICE provides an essential foundation for thoughtful and effective literary analysis.